Last week, when President Obama requested the largest-ever military budget since World War II, hardly anyone batted an eyelash. The Bush years immunized many of us to the shock of colossal defense spending bills skating across the table – and zipping through Congress to sure passage – regardless of shriveling public approval. Perhaps, more eyelashes would have started batting if Americans realized that this year the US will spend more on its occupation of Afghanistan alone than any other country except China spends on its entire defense budget. There’s no question that war spending for Iraq and Afghanistan will top $1 trillion after Obama’s request is implemented. That’s enough money to stretch – in dollar bills – from the earth to the sun. It’s also enough to pay for ten years of universal primary education for all of the world’s children, according to UN statistics. It costs $1 million to keep one soldier in Afghanistan for a year. The same amount of money could build 30 or 40 girls’ schools in Afghanistan – one surefire way to reduce the number of men joining the Taliban over the long term. This simple numbers game begs a painful question: as we fling ever more money toward war and occupation, where’s the funding for peace? The answer: it’s there, but you’ll miss it if you blink. US defense spending has long been notoriously imbalanced between military and nonmilitary priorities, and Obama’s 2011 budget is no exception. In fact, it’s even worse than usual. Military spending towers over spending on preventative measures by a ratio of 12 to 1, according to statistics from the Institute on Policy Studies. Last year, it was 11 to 1 – roughly the same as the ratio under Bush. 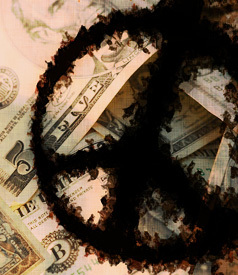 Despite a Democratic Congress and administration – and a Nobel Peace Prize-winning president – nonmilitary security funding is still being squashed by its nasty counterpart. Steps like providing disaster assistance, aiding refugees and contributing to international health care would go a long way toward deterring potential terrorist wannabes. Plus, decreasing our dependence on oil, shoring up our homeland security and finding safe ways to reduce nuclear weapons could deter future hawkish US leaders from waging war for stupid reasons. During the violent conflict that erupted in Kenya during its 2007 national elections, an American NGO called the State Department to consult with the appropriate people on the Kenya desk. They were told that these people were out of the office and not available. Asked when they would be available, the person on the phone replied that only two people covered Kenya, and both were on extended leave. In other words, nobody was home at the US government, it appeared, to be “first diplomatic responders” to this crisis. Nobody home to respond to an international crisis, in a government whose “security” budget now reaches solar-systemic proportions? It’s time to redivvy up this pie. Nonmilitary programs are the true security measures. Not only are they a whole lot less likely to kill innocent people, but they also offer further-reaching, longer-term rewards. In this age of never-ending wars, military spending is band-aid money, in a ghastly sort of way: as conflicts erupt, we continually attempt to bandage them with bombs, instead of addressing the root cause of each injury. If we want to salvage “security” policy, we must reconceptualize what it means to keep our country safe. Otherwise, we risk simply reapplying the bloody band-aid until the money runs dry.